To further enhance your customers coffee experience, present them with a high quality wafer or complimentary biscuit with every cup that you serve. For the more adventurous palate top your coffee with our mini mallows or a variety of sprinkle toppings. 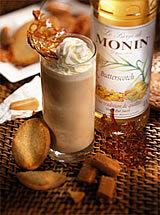 Create a delicious unique signature drink with our flavoured monin syrups. With more flavours than you could imagine Monin is the leading global producer of gourmet flavouring syrups for use in bars, coffee corners, restaurants for professionals and lovers of quality throughout the world. Almond, Amaretto, Banana, Caramel, Cherry, Chocolate, Chocolate-Mint, Cinnamon, Coconut, Gomme, Grenadine, Hazelnut, Irish, Kiwi, Macademia, Mango, Melon, Marshmallow, Mint, Orange, Passion Fruit, Pineapple, Pistacchio, Raspberry, Rum, Strawberry, Vanilla.